I might have mentioned before that my husband and I have almost nothing in common. We are complete opposites. But just like 2 puzzle pieces, it works! We rarely like the same shows, but one that we both love is The Pioneer Woman. He gets ideas for fire station meals and he also likes all the ranchy stuff. Often while we are watching it I will say, " do wish she was your wife?" Because she makes cinnamon rolls, chicken fried steak, cobblers, hand cut french fries, and all his other favorites. I can make... taco salad! The other night while we were watching a DVRed episode, Ree made chocolate peanut butter pie. My mouth was watering. Those are 2 of my favorite things, after Marcus and Katie, of course. This picture is from The Pioneer Woman and here is her recipe for Chocolate Peanut Butter Pie. So I made one this weekend for our Sunday lunch with my in-laws. It was pretty heavenly. And it was super easy. I didn't even mess it up. Guess who didn't even try a bite? That's right, Mr. Opposite. His love for peanut butter and chocolate is about as equal to his love of carrots. He can take it or leave it. I, on the other hand, can take it or take it! Anyway, I thought if you had good taste, like me, you might want the recipe too! Maybe next I will try to tackle P.W. 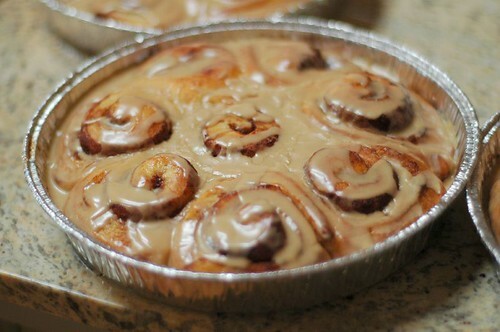 's cinnamon rolls! Cinnamon rolls are something we have in common. That's the recipe for a good marriage! My neighbor makes PW's cinnamon rolls every year for us right before Christmas! They are delicious and I'm so thankful she shares them with us! Her cinnamon rolls are heavenly! I saw the same episode and ran out to buy the ingredients. We're trying it on Sunday night. Sounds so yummy! uh what... who doesn't like peanut butter and chocolate? does he like reese's peanut butter cup? i made her pb pie and loved it! i want to try her cinnamon rolls, but making the dough intimidates me! It all looks yummy to me!